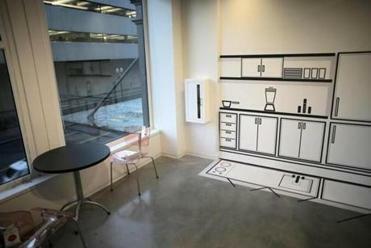 The living and kitchen area of the two-bedroom unit on display in the Boston Society of Architects’ “One Room Mansion” exhibit. When it comes to scaled-down living, Aeron Hodges doesn’t just talk the talk. For six years, she and her husband have affably shared a 375-square-foot Fenway apartment, which, it should be noted, is far from the most cramped space they’ve ever called home. It’s an appropriate dwelling, certainly, for the cocurator of the new “One Room Mansion” exhibit at BSA Space, an initiative of 2016 Boston Society of Architects president Tamara Roy aimed at extolling the virtues — and possibilities — of compact urban living. 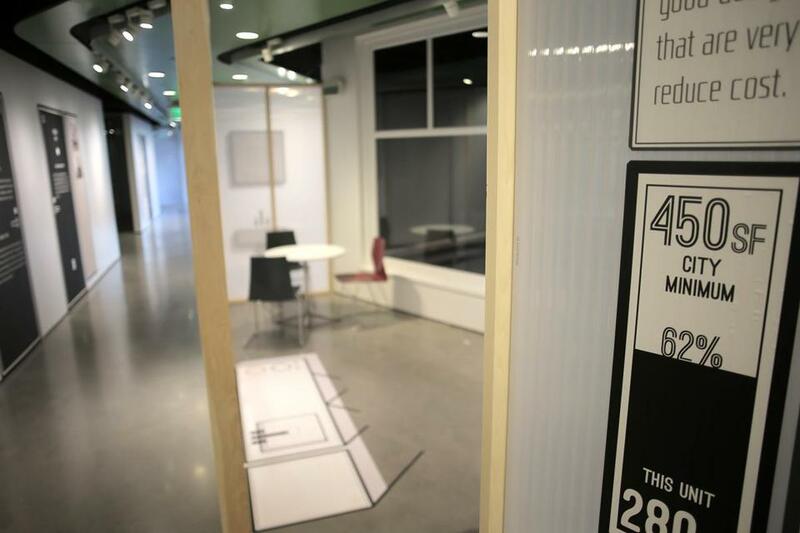 Designed to approximate an entire floor of an apartment building, the exhibit, which opened last month and runs through Feb. 6, explores how the future of urban living might look — that is, how a seemingly small space can be optimally utilized. The kitchen and dining area of the 355-square-foot, one-bedroom unit. The bulk of the exhibit consists of three primary apartment units: a 280-square-foot studio, a 355-square-foot one-bedroom, and a 615-square-foot two-bedroom that could, theoretically, house three or four people. 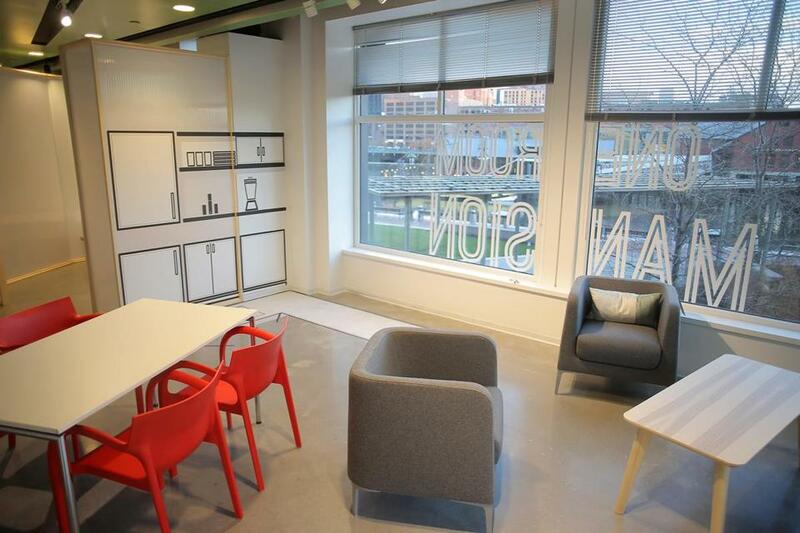 Additionally, there’s a bevy of shared spaces located throughout the space, from a laundry room to a lounge to a communal work area, meant to foster a sense of community living. The idea behind the concept is simple enough: In a city struggling to provide affordable housing, here, in the flesh, is one potential long-term solution. 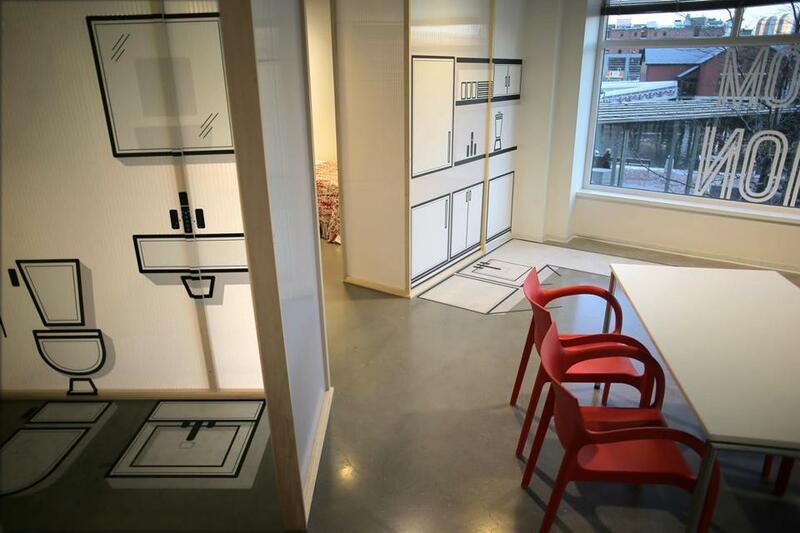 It raises one more question, too: Could Bostonians really live comfortably in a space so small? Despite the rise in popularity of pared-down living, it remains hard to imagine a 280-square-foot unit inspiring much interest on Craigslist or Zillow. 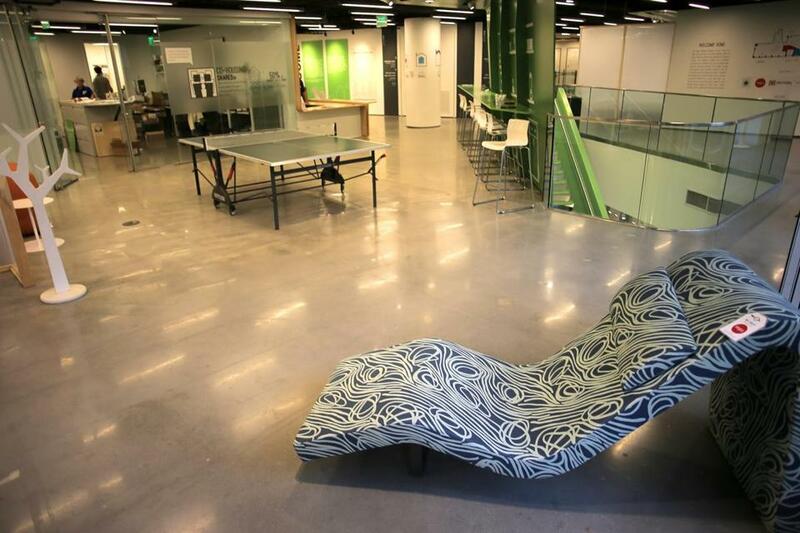 Organizers, though, are banking on the fact that by showing potential dwellers how a creatively designed space could look, instead of just describing it to them, they can alleviate some of the preconceived notions. Indeed, wandering through the exhibit on a recent morning, it’s hard not to be struck by the amount of space afforded by, say, a 355-square-foot one-bedroom unit. There’s a kitchen, a bathroom. Plenty of space for a bed, dining room table, and storage. The massive windows looking out onto the city don’t hurt, either — though it’s safe to assume that such views would not come standard. The designs are deliberate. While researching the exhibit, significant effort went into utilizing the space as effectively as possible — on the walls between units, you’ll find prints of compact living quarters in other countries — while appealing to a variety of individuals: everyone from students to young professionals to small families to empty-nesters. The push for suitable — and affordable — city housing is nothing new, of course. 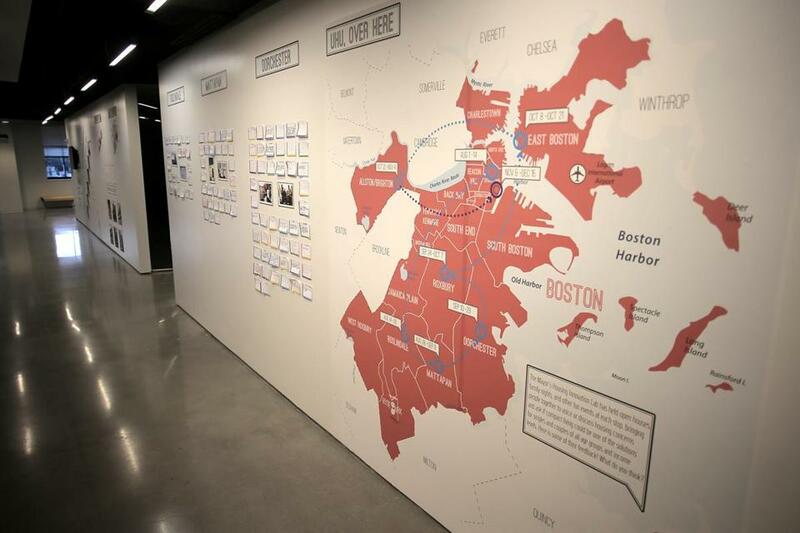 The exhibit looks at housing needs in multiple Boston neighborhoods. According to Roy, more than two-thirds of the city’s population is made up of one- and two-person households, while less than one-third of the housing stock is studios or one-bedroom units. Based on the Census Bureau’s 2014 American Community Survey, meanwhile, single-person households make up nearly 40-percent of the population in Boston, while only 6.1 percent of homes are studios. Mayor Martin J. Walsh has made no secret of his goal to add 53,000 housing units in Boston by 2030, and not surprisingly, a growing contingent has focused on compact living as a way to meet that goal. In addition to the “One Room Mansion” initiative, for instance, Roy served as a co-designer of the “uhu” — or Urban Housing Unit — a 385-square-foot $75,000 standalone modular house that went on a local roadshow earlier this year. There’s also the Housing Innovation Competition in Roxbury in which teams of developers, architects, and contractors submit proposals on how best to utilize land at three different locations. At the same time, the feasibility of a structure depicted in the exhibit remains something of a question mark. Currently, city zoning regulations impose minimum-square-footage requirements on new buildings. According to exhibit organizers, for instance, a unit billed as a studio must be at least 450 square feet, a one-bedroom must be 625, and a two-bedroom must check in at 850. All of the units in “One Room Mansion” would fall short. But those behind the push for innovative solutions seem confident that, if the feedback supports it, updated regulations could follow relatively quickly. Thus far, organizers said, the response has been encouraging. And the more people who find themselves exposed to the possibilities of compact living, the thinking goes, the better. “It’s important for us to lift the myth behind small living,” Hodges said. The entrance to the 280-square-foot studio. According to exhibit organizers, a unit billed as a studio must be at least 450 square feet, a one-bedroom must be 625, and a two-bedroom must check in at 850. The living space, bath, and kitchen of the two-bedroom unit.